NOT ALL SUCTION CUPS ARE CREATED EQUAL ★ Our unique Twist-&-Lock technology guarantees the most powerful and everlasting hold on the market! 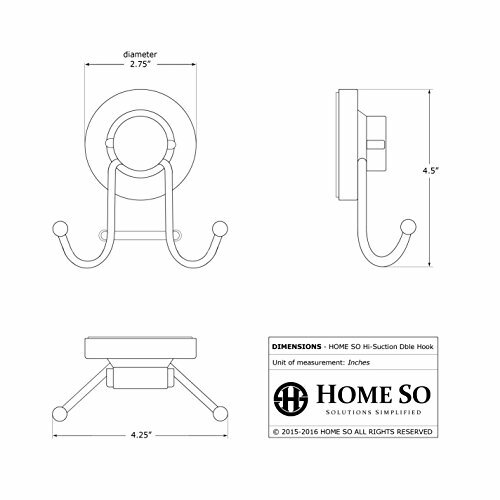 Many may look similar, but only Home SO's suction cups are certified to hold 30 lbs, even in super wet environment! NO TOOLS. NO SCREWS. 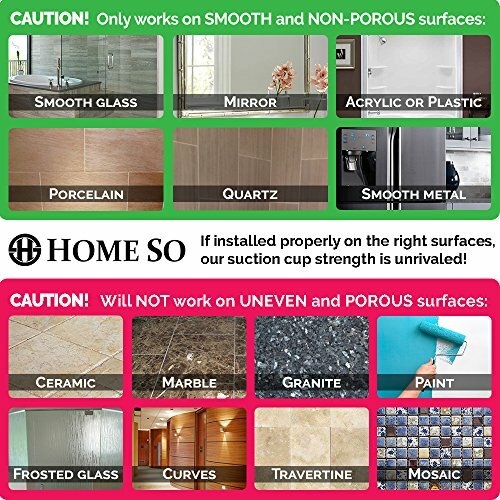 HASSLE-FREE INSTALLATION ★ No more ugly holes in your shower or bathroom! Simply choose a smooth surface, twist the knob, and you're done in no time! The hooks are removable and repositionable, and won’t leave any marks or sticky residue! 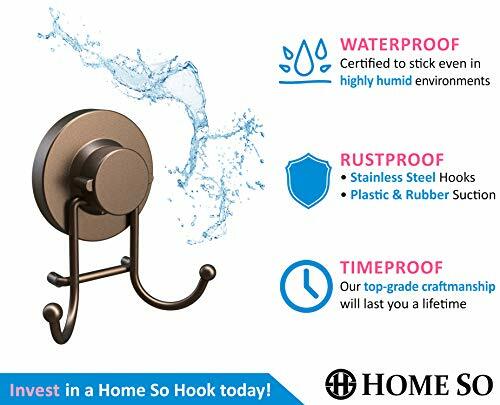 AWARD-WINNING DESIGN ★ Multi-purpose hooks made of Stainless Steel are designed to hang almost anything: towels, loofahs, bath robes, squeegees, kitchen tools -you name it! BUY WITH CONFIDENCE. BUY AMERICAN ★ 100% Satisfaction Guarantee or Your Money Back! We're a US-based company, so make a difference by choosing us over all the foreign sellers! Plus, we offer clear instructions and friendly Customer Service, all in proper English! Ordered a suction cup hanger from Amazon with points. Both the points work and the hangers work! 100% satisfied. this is the only hook that will not fall out after the water inside dried out! 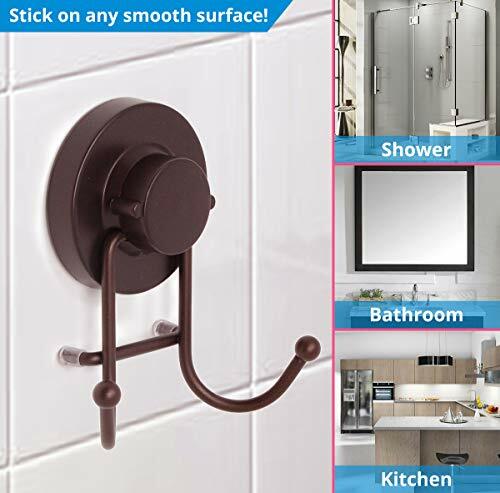 These Towel hooks with suction cup, work great. The color is nice and the hooks sturdy. Have it hanging on my shower door for an extra hook. Would consider purchasing again! Great size, holds a heavy robe, easy to use. It's very powerful and can hold heavy items with easy. Follow the helpful instructions to ensure they stick. They use a twisting action suction cup that holds it to the surface of your choice. They work great in the kitchen or bath room. The design on these is simple, you stick it to a wall and then when you tighten the circular screw, it makes more a vacuum so it sticks on the wall better. It's easy to use and looks pretty classy, just like in the images. The hook part can also pivot upward 90 degrees, which might have a use for some people. The quality is quite good for the pricepoint. It had detailed instructions and I was able to follow and fix it in the bathrooms. I have been using it for a while without any wobbling. Key is to install it on a dry and smooth area and tighten thoroughly. I wish they made one for walls and porous surfaces as well. These are large hooks, can hold up heavy items. They stuck really well! Works great and hold enough to fulfill the need. Our towel rack is far from the glass shower door. I attached this to the glass on the outside of the door and now do not have to get out and walk over in the cold to get a towel. Worked perfect and as advertised. Quality product as described. It looks really stable. It is good to hang on the bathroom. I was skeptical on how much weight this would hold until I finally put it up in the bathroom. 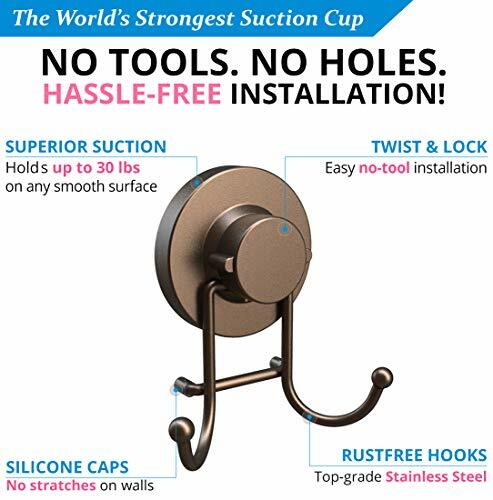 I have tried flip lock style suction cups in the past and they didn't stay up very well. This one if different as you actually screw a bolt in to get the suction cup to lock in. Once it was locked I tried pulling it off of the glass and it wouldn't budge at all. The color match between the plastic base and the metal hooks is very good, you cannot tell they are different materials. Arrived in a timely manner and in good condition. Easy to use and works as expected/described. Reading the instructions makes it easier to use and put together. I was surprised at how well these stick, plus they're super easy to mount and move around. I put one on the inside of my shower on the glass block wall and the other in my granddaughter's room. It actually held up her heavy wet bathrobe and a wet towel - which is quite amazing! I am not great at installing noting however these were very easy and I did it myself. Looks great in my rustic theme bathroom. Very nice they are smaller then one would imagine, but because of that they take up less space. Very nice color as well. Hooks are solid. Used it in my bathroom and they hold pretty well. No issues in suction. Love these hooks. Can be used for a lot of things. I use mine in the shower to hang my loofah on. So far it’s holding up great. Ordered in bronze and received an almost black color. Which i like better anyways. Surprised as to how strong the hooks were I'm normally skeptical of the suction cups but it works great. These hooks are well made. Quality item. Must be glass or really flat surface is the only negative. I got these towel hooks to do some organizing in my bathroom and they did just that very well! They come with instructions that clearly explain how to install them for the best suction and once you read the instructions the installation is very easy. A lot of products in this price range can look very cheap however these are well made and look very nice. Also after a couple days of usage they are still holding on strongly. I even tried pulling on it as hard as I could but could not get it to come off. These are a really great product and a good price. I would highly recommend them. Wow, I'm really impressed with the strength of these small hooks. This is both sturdy and gorgeous! I use them in the for towels and potholders. It looks great! Worth it! It works great for mirrors but won't stick to wooden walls properly. this product is very nice. they look good in my shower, the kids have started using them instead of hanging the scrubbies on the shower head. Nice dual hooks that have been sticking well for two weeks so far. Nice dual hooks that have been sticking well for two weeks so far. Good to hang some of my stuff in the shower to keep it from cluttering up the tiny shelf space. Sturdy and hold on to the wall exactly like you want them too. Hanging heavy wet towels And even a wetsuit. Love them. Love it. Nice design quality hook. It is super sturdy. I can put anywhere in my house, no limitation. It is so easy to install and uninstall. One of the best hook I ever own. Purchased these hook for my son's apartment to give extra hanging room for his towels. They are very sturdy and I love how they blend in with the existing finish in his bathroom. 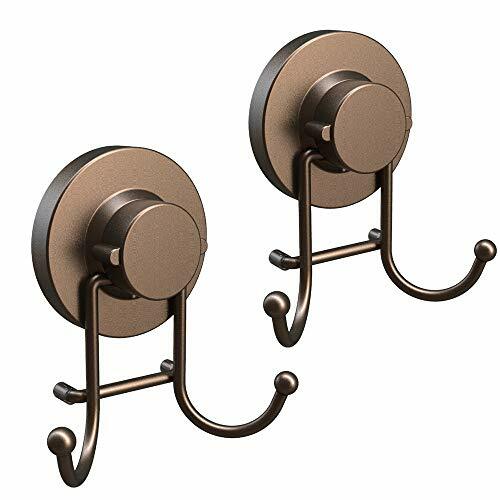 These hooks stick well and are sturdy, as well as super easy to install with no tools. I've attached them to a mirror and they work great. I'm very happy with suction cup hooks. They are exactly what I needed in my bathroom. I will be buying more. I love these hooks! So far they are standing up fantastically. The are sticking well on a plastic tub surround and also on a tile surround. Easy to use and nice looking too! I personally really like these due to how stable and durable they are. I have bought other kinds before and they would always fall down or not be able to hold much but these never fall and hold so much weight! Stable, and super-easy and quick! It took me literally less than 2 minutes to install each of these properly...and they are holding well so far. Very versatile, use it for wet or dry bath items. Make sure you have the appropriate surface to stick it on, but you need a very small surface for the hook. Great quality product. Added it to my kitchen and now I can hook many things to it. I would highly recommend this awesome product. It works great for exactly what I needed it for. It holds on very strongly to the inside of my shower and holds up my shower caddy and my loofahs. Highly recommended. Very high functioning suction cup. I put a lot of pressure on it and it didn't budge seems to be very sturdy. The star deduction is because only the hook and screw are made of metal. These hooks are AMAZING!!! Very easy to use! I would recommend them to anyone! I will be ordering more! These stay just were you put them. I will be buying more for gifts. I always have problems with things sticking and I don't have to worry with these. They are great! This product was a great addition to my bathroom. 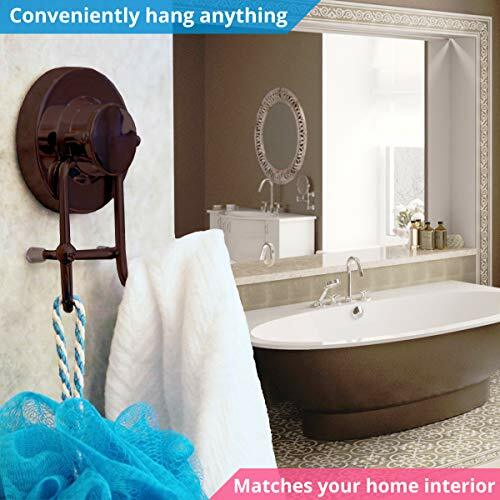 It added ambiance and elegance to my bathroom, and I will definitely recommend this to others! This is exactly what you would expect. Suction cups work well, the design is modern and sleek. The bronze color looks great as well. Wanna it a very awesome site to have a free stuffs for us, What a great ideas you have for a needy people like me. Stick tight to the wall, hold my towel and cloth just fine. Easy to install.